This statement is never accompanied by a cogent logical argument against one of President-elect Trump’s policies or plans, rather it is a bold statement that force and violence will be used to stop the duly elected President of the United States from carrying out his lawful duties. 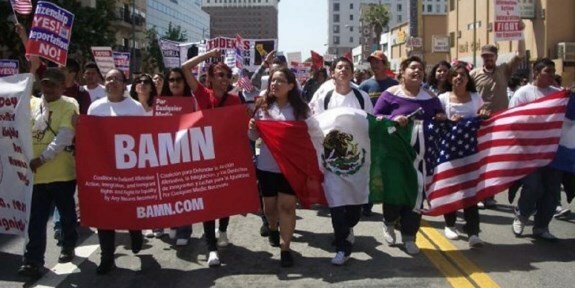 You can get a flavor of what this is all about on the website of bamn.com, a Far-Left group dedicated to the idea that TRUMP MUST GO BY ANY MEANS NECESSARY. But is this really all about Donald Trump? As we explained in our “The Summer Revolution” series (especially Part 4) it wouldn’t matter if Donald Trump or Jeb Bush had beaten Hillary Clinton, the scenario would be the same, because the Far-Left isn’t interested in defeating individual political candidates, they are interested in destroying constitutional government and creating chaos through which they will seize power. Several groups, including some with ties to funding by George Soros, are dedicated to actually stopping the inauguration “by any means necessary.” They include an anarchist group that calls itself “DisruptJ20” that says it plans to blockade roads into Washington through what they call “clusterf**ks.” They seem to have put out a creepy propaganda video “No Peaceful Transition,” complete with robot narration. Out among mobs of protesters on the streets of Washington, observes Morabito, the potential for crazy runs high, especially among those whose brains sizzle on PC. Security officials are particularly concerned about the possibility of confrontations between protesters who hope to bait many of the million or so people expected to attend the inauguration. The Inauguration Day demonstrations can also serve as an object lesson for many American observers suggests Morabito. First, they will give us a good picture of the bullet we dodged, the type of PC-induced intolerance that would have been more broadly infused into America had the other candidate won the presidency. Second, we’ll get a really good inspection of what political correctness looks like in its more advanced stage—after it’s morphed literally into mob behavior. Of these we recommend CHQ readers keep a sharp eye out for the last one; projection. Tyrants always project their own intentions onto their opponents wrote Morabito. So, without the idea of rule of law—which is exactly the sort of society a communist-based group “Refuse Fascism” promotes—you end up with inequality under the law. Whoever has power gets to decide who does what to whom. Just watch as the protesters accuse their opponents of exactly the sorts of behaviors they are demonstrating—intolerance, irrationality, and even violence. Worse, many of them openly support a form of government that increases these traits. In the case of Carl Dix and “Refuse Fascism,” it’s communism; in the case of #DisruptJ20 it’s anarchy, in which the strong end up lording it over the weak, every time concluded Stella Morabito, and we agree. Submitted by email_registrat... on Thu, 01/19/2017 - 17:07. Obama brought the terrorist to America and now his domestic supporters are following suit to get their way. For so many years we listen to Obama blame Rebublicans for not working with democrats. Their resistance was in a law abiding orderly fashion. When democrats don't get their way they protest vilonently, attack the police, burn cop cars and threaten harm to any one opposing them. This is the very definition of terrorism. Ironically, when their not protesting Republican Presidents with violence their protesting war and preaching peace. Hypocrites. Submitted by email_registrat... on Thu, 01/19/2017 - 15:02. The liberal progressives, that supposedly protest for all Americans, have missed the mark. They protest because they are the most spoiled, intolerant, self absorbed, selfish group of crybabies our country has ever spawned. They will not allow anyone else's opinion to be heard. They shout down, talk over and interrupt different views, and when all else fails they become vulgar name callers and then turn to violence. They destroy public and private property in the name of protest. Had the conservative faction of Americans behaved this way, these protesters would be calling us racists, thugs, prejudiced, homophobes and any other derogatary term they could come up with. Well they don't protest for me. I think they are so far out of line it is unbelievable. They have threatened the life of the president-elect, ministers, tried to disrupt the life of the vice-president elect; their behavior is shameful.